You can volunteer with animals, be a veterinary volunteer, dog or cat volunteer, and get hands-on veterinary experience – no matter what your age. You just need to know where to begin. We know your story. You decided early in life that you wanted become a veterinarian and now you want to explore your dream. You want to get animal experience, work with animals, and volunteer wherever you can but you are finding it hard. Everywhere you turn, people are telling you that you aren’t old enough to be volunteering with pets. Vet Set Go understands just how you feel and we’re here to help get you started volunteering with animals or working as a veterinary volunteer. The first thing you should know is you are not alone. Veterinary medicine is a calling that starts early in life. For the majority of veterinarians practicing today, the desire to become a veterinarian started when they were very young. In fact, in a nationwide survey, 65% of veterinarians told us they decided they wanted to become animal doctors before they were 13 years old! Just like you, they knew they wanted to spend their life working with animals. They also knew that they wanted to volunteer with animals as soon as possible. Are you just starting out on your journey to become a vet or are you looking for advice from a veterinarian? We can evaluate where you are and give you recommendations on what you should do to get closer to your dream of becoming a veterinarian. The Become a Veterinarian Quiz is a great way to get custom advice based on your age, experiences and interests. This quiz was developed by veterinarians to help you continue on in the right direction. If you want to become a veterinarian, getting animal experience is important. The best place to start is in the home. Veterinarians are caring, be responsible, and observant. Taking care of your pets at home is one of the best ways for you to develop these same qualities and more. See if you can be the one that feeds them, brushes them, and takes them on walks. As you develop your animal care skills, you can grow your experiences by caring for the pets of your neighbors and maybe even pet sitting for them. Don’t have pets at home? Take a look at the other sections and videos on this page to find out how you can get the animal experience you need. Want to know more on this? Get the Vet Set Go book. It is our complete guide becoming a veterinarian for tween and teen aspiring veterinarians. It goes through caring for your own pet and shares stories from other future veterinarians who have started out this same way. Do you want to be an animal shelter volunteer, a humane society volunteer, or even an SPCA volunteer but you are constantly being told you are too young? We have the solution for you. Fostering is the perfect option for any person who wants to become a veterinarian but has been told time and time again that they are too young to work with animals in the shelter facility. With fostering, you and your family take care of shelter animals in your home. Often these are kittens and puppies who are too young to adopt out. They can also be dogs and cats that are recovering from an illness or surgery. You are responsible for the care, feeding, exercise, and socialization of the animals under your care until they can be adopted out to a forever home. Fostering allows you to impact the life of individual animals. You can be the one that shows them love, socializes them, gives them good nutrition, and helps them get ready for adoption. It can be a great way for you to change and animal’s life! Are you just starting out on your journey to become a vet or are you looking for advice on what you should be doing next? We can evaluate where you are and give you recommendations on what you should do to get closer to your dream of becoming a veterinarian. The Become a Veterinarian Quiz is a great way to get custom advice based on your age, experiences, and interests. This quiz was developed by veterinarians to help you continue on in the right direction. Zoo and veterinary camps have become more and more popular over the past decade because they are safe and easy ways for aspiring veterinarians to get experience with animals outside the home. Zoo camps allow future veterinarians to go behind the scenes to places were regular visitors aren’t allowed and get close-up views of the animals in their habitats. Zoo camps let aspiring veterinarians touch and hold exotic animals while learning directly from zoo keepers about the animal’s behavior and diet. If you want to become a veterinarian, veterinary camps are a dream come true. 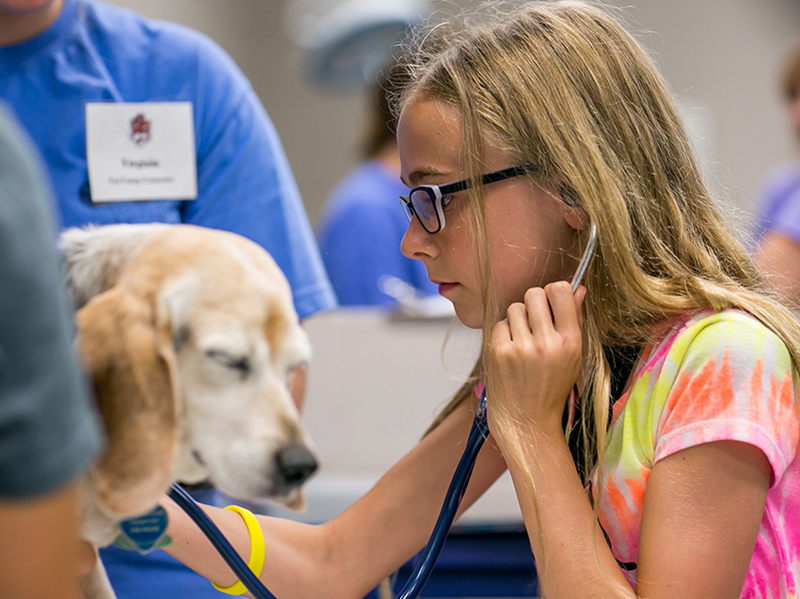 Offered at various veterinary colleges throughout the country, veterinary camps allow aspiring veterinarians to explore veterinary medicine and learn more about the science of animals. 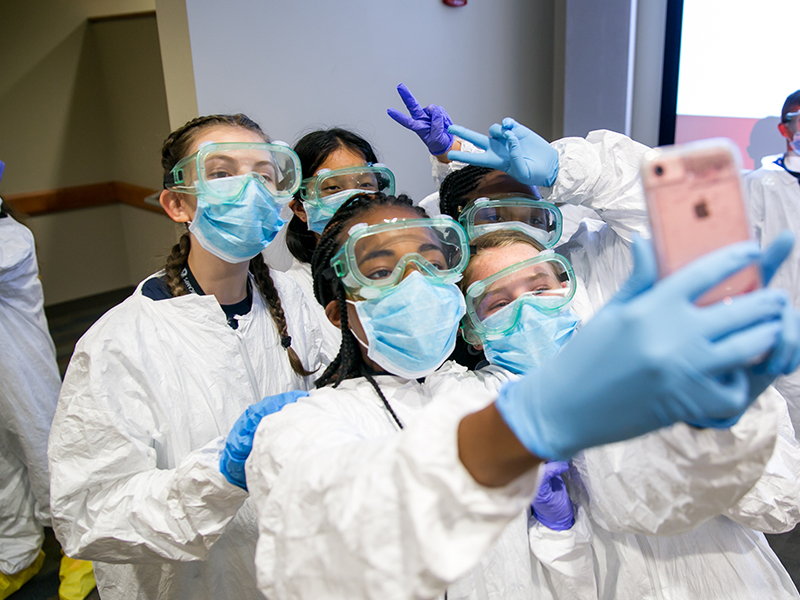 Veterinary campers do things that are typically done in veterinary school like gown and glove for surgery, learn how to suture, and learn how to do a physical exam on a patient. How much animal experience do you have? Is it enough? We can evaluate your level of veterinary and animal experience and show you where you are compared to other aspiring veterinarians who are the same age as you. We then will give you specific recommendations on what . what you should do next to raise your experience levels. The Become a Veterinarian Quiz is a great way to see where you are and get custom advice based on your age, experiences, and interests. This quiz was developed by veterinarians to help you continue on in the right direction. The best way to understand veterinary medicine is to spend a day with a veterinarian and see what their day is like. When you "shadow a veterinarian, you follow them through their day and see exactly what it is like. It is the best way to explore veterinary medicine and learn what different types of veterinarians do each day. Shadowing can will let you see what it is like to go into an exam room, what veterinarians discuss with their clients, how they perform a physical exam and what tests they run. You may even be fortunate enough to watch them take radiographs, perform dentals or even follow them as they go into surgeries. It is a great way to learn that every day is different for a veterinarian and if you are a practicing animal doctor you need to be ready for everything that comes your way. To get started, you need to first decide the type of veterinarian you want to shadow. Are you a horse crazy girl who only dreams about caring for horses? Do you have snakes or bearded dragons at home and you want to follow a veterinarian who cares for reptiles? Or are you a beach lover who wants to shadow veterinarians who care for sea turtles and/or dolphins? Once you have made that decision, you’ll need to locate the veterinarians in your area who practice those specialties. Sometimes veterinary clinics will tell you that they want their volunteers to be 16 years or older. Don’t let that stop you! Many veterinary hospitals have programs for future veterinarians. Ask if they have an open house or a veterinary camp for aspiring veterinarians. If they do, see how you can enroll. There are other ways to help. Many veterinary hospitals set up funds for pets that are abandoned or for people who can’t afford medical care for their pet. See if you can help out veterinary clinic raise money for these situations through a bake sale, car wash or some other activity. This is a great way to build a relationship with the veterinary hospital team and often opens the door for future volunteer opportunities. Do you want to learn everything you need to know in order to shadow a veterinarian? The Vet Set Go book gives you step-by-step instructions on how to find a veterinary hospital in your area that will let you shadow. It gives you example letters/messages to send when you first contact the veterinary clinic, it tells you what to wear when you are going, how to behave the day of your visit and what you should do after your shadowing day is complete. It is a comprehensive guide to getting your first veterinary shadowing experience. The key is to find some way to help out. No matter how small, try something. It gets you out there and helps you get the animal experience you desire. Almost without exception, Vet Set Go members tell us they started “volunteering with animals” in their own home. They helped feed, train and groom their family pets and, in return, they learned the basics of animal husbandry. Soon they become “the” caregiver for the family pet and, for some of them, this experience motivated them to start their own pet sitting business. Other, Vet Set Go members told us that they just went out and found a way to help – sometimes creating their own community service programs. When shelters wouldn’t let them work directly with the animals, they donated their birthday money for dog food, cat trees, or toys for the animals. Some of them had bake sales, car washes, or other fund raisers and donated their money to their neighborhood animal shelter. These members created their own volunteer opportunities and these experiences helped them build relationships with their local animal shelters. Once they had relationships with the local shelter personnel, it wasn’t long before they were fostering pets or working with the shelter animals. What ideas do you have? Find a way to help animals in your home and in your community and it won’t be long before you are truly a veterinary volunteer. Don’t know exactly where to begin? Then take the Become a Veterinarian Quiz and get customized advice base on your education and experience. You will not find better advice unless you have a veterinarian available to personally mentor you.